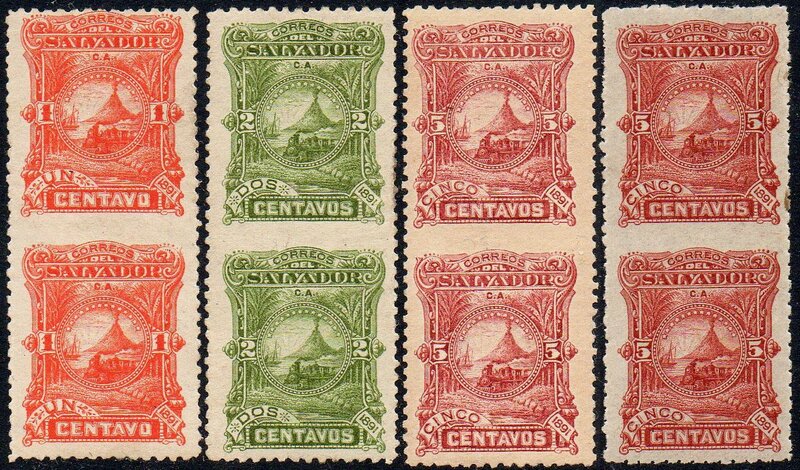 Sellos Postales El Salvador: 1891 Volcano & Steam Train stamps. The name Seebeck continues to cast a shadow over Latin American philately, well over a century after the demise of that gentleman's contracts with the postal authorities of Ecuador, El Salvador, Honduras Republic and Nicaragua. Given the plethora of 'agency' issues that have changed stamp collecting since the 1990s, Seebeck's behaviour was really quite restrained! Between approximately 1890 and 1900, Nicholas Seebeck of the Hamilton Bank Note Co., negotiated with the aforementioned four countries for the sole rights to produce their stamps. Under the contracts, he would supply new issues each year, without charge, to the postal authorities. At the end of each year, the stamps were demonetized (i.e. decreed invalid for postage) and the remaining stocks were returned to him. The contract further stipulated that Seebeck could reprint the stamps, but only for sale within the philatelic market. 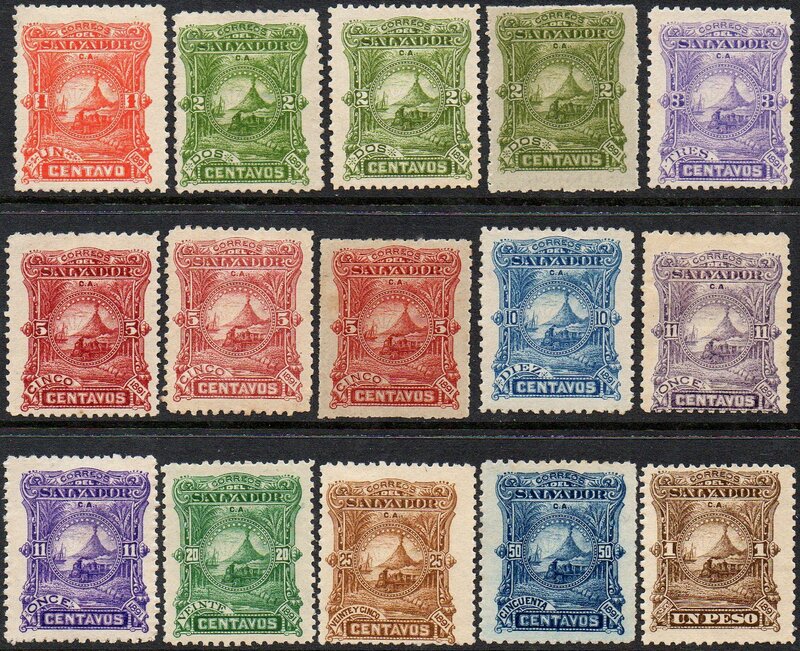 This was one of the main reasons why, throughout the subsequent century, the stamps not only of these four countries but many other Latin American countries besides, had an almost second-class status unfairly bestowed upon them, often by many allegedly-knowledgeable philatelists. Even now, there are dealers and collectors who readily brand Latin American stamps as 'full of forgeries and reprints', even though the Seebeck period lasted but a decade and involved only four countries. In any case, reprints and forgeries are a common feature of much of the early philately of many parts of the world, especially Europe and the Far East. As Seebeck had access to the original printing plates, identifying original stamps can be very difficult, in some cases almost impossible. 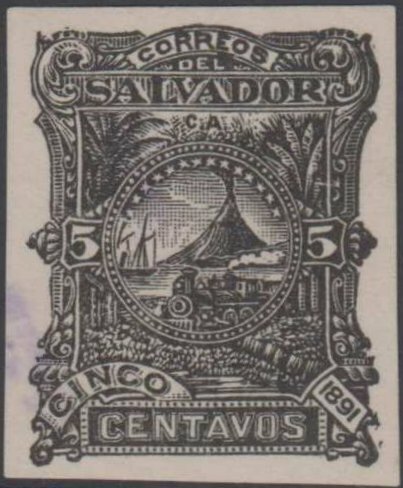 However, in the case of the 1891 El Salvador stamps, it is usually not too difficult. Please note that, in our listing below, we have not listed the reprints. We had thought that these only existed for the unsurcharged stamps, but, after studying the ' 1 centavo ' surcharge on a number of stamps, there is prima facie evidence that some surcharged stamps may also be forged. Issued 1c of 1891; Undenominated Proof in Black & Imperf. Proof in Green (1c), both on India. 5c Proof on Laid Paper in Black. Original stamps are on off-white paper of medium thickness with white or yellowish gum. Some gentle age toning may account for the yellowish gum. Reprints are on quite thick paper with brownish gum. Additionally, there are proofs, imperforate, in both issued and unissued colours on India Paper, which is a very white, rather thin paper. SHADES: Michel, Scott and Yvert do not list any shades. SG gives three colours of the 2c, two of the 5c, two of the 11c, two of the 1p. We have simplified this into two 2c shades in the listing below. The reason for this is that, in our opinion, SG's 'pale yellow-green' and 'green', whilst different, are no more marked than small shade varieties found on virtually all values. Where we have listed more than one shade, these appear to occur in quite similar quantities. IMPERFORATE STAMPS: Michel footnotes that the 1c, 10c, 11c, 20c, 50c and 1 peso exist Imperforate. Scott and SG do not mention them; Yvert indicates that some values exist imperforate in their heading. Based on what we have seen, we are at present content to list these stamps as per Michel, although further research is perhaps needed. ** These 'sewing-machine' type perforations only seem to occur on the 2c and 5c and are footnoted in Michel. Both are illustrated in the scan above. *** We have seen three of these control numbers, 228, 249 and 258, printed in greyish-green ink under the gum, all of them on 1 Peso stamps. Our only information on these comes from the Michel catalogue, which suggests that these controls only occur on the 1 Peso reprints by Seebeck. **** We have seen vertical pairs, imperf between, of the stamps thus marked. They all appear to be Seebeck reprints and are shown below. Other partial perforations probably exist. PROOFS (with face values) on white India Paper : We have illustrated and listed those which we have seen, which were presumably created principally as colour trials. They are always without gum. Those marked with an asterisk (*) are either in, or very close to, the issued colour. We do not claim that this is an exhaustive list but neither do we think that there are a large number more, at least for stamps with a face value. As for undenominated proofs, we have only seen the one in black shown near the top of this page, but we imagine that several more will probably exist. For the present, however, we have only provided a listing for this undenominated proof in black. Additionally, we have seen a 5c in Black on Laid Paper (see line of scans near top of page), which we believe to be of a different status to the proofs on India Paper and this is therefore listed separately. [ ... ] 5c Black on Laid Paper, Imperf. Other proofs on Laid Paper may exist. 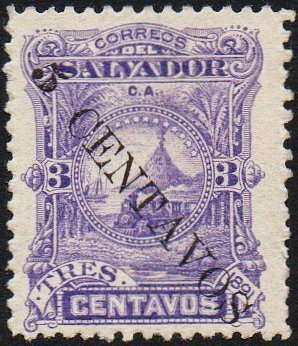 There were three surcharges on the above issue, all produced locally by the Salvador Post Office out of genuine need, in response to a shortage of 1c and 5c stamps. There are two styles of surcharge for the 1c/2c, UN CENTAVO and 1 centavo . Information on the dates of issue, and even the sequence of the issues, is conflicting, depending on the catalogue chosen, but April and August are indicated. Based on the urgency with which the stamps were required, we consider it likely that the first 1c/2c issue (in April 1891) was the '1 centavo' surcharge, which is primitive and appears to be a handstamp, whilst the 'UN CENTAVO' surcharge is clearly machine-overprinted and probably the August issue. Some notes seen by us appear to suggest that the original (Jan 1 1891) printing of the 1c was limited to an inadequate 50,000 stamps and there was a decree of April 1st 1891 which authorised the surcharging of 200 Pesos worth of 2c stamps (10,000 stamps) with a new face value of 1c. The notes go on to suggest that, towards the end of the year, further 2c stamps were surcharged 1c, perhaps for use when sending out New Year cards. The 5 CENTAVOS on 3c was produced against a decree of August 17th 1891, which authorised the surcharge upon 600 Pesos worth of 3c stamps (20,000 stamps). The date of issue, August 1891, for this stamp is given by both Michel and SG. 1891 Surcharges on the train and volcano issue. Mi. 46-48, Scott 57-59, SG 49-51, Yv. 46-48. Orientation of the Surcharge: On all three stamps, the NORMAL surcharge is diagonal, reading from North-West to South-East. Issue believed to be from April 1891, 1c/2c handstamped. 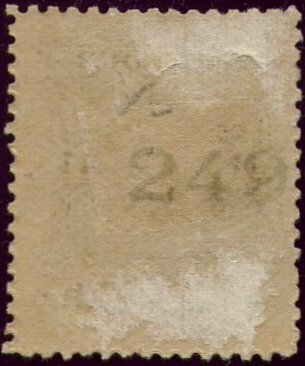 Issue believed to be from August 1891, 1c/2c machine-overprinted, surcharge in Black. [ ... ] UN CENTAVO / 2c Yellow-green to green (Mi. 46, Sct 58, SG 50a, Yv. 46 ). Issue of August 1891, 5c/3c machine-overprinted, surcharge in Black. We have little information on whether these surcharges were re-produced by Seebeck, especially the question of whether the handstamp for the '1 centavo' was ever in his hands. More information on the surcharges, in particular, would be most welcome. Can you help? 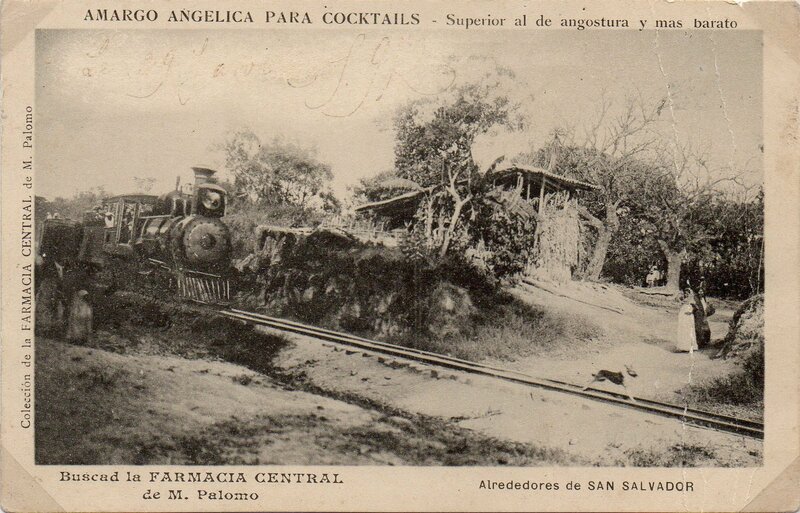 We finish with a postcard of a railway in El Salvador. Interesting cards on this topic from El Salvador appear to be extremely limited. This is one of the very few we have seen, an advertising card for a pharmacy / pharmacy products with a train in a rural setting chasing a dog!